From a feature on OhDeeDoh. Many of our products are geared towards the wedding day but lots of what we make can be fun for kids too... (cant wait to share a new line of products for little ones). I love the balloon wreath on the table! Now imagine all of this with one of our guestbook balloon houses. We can only imagine Kieran's delight at this delightful party. 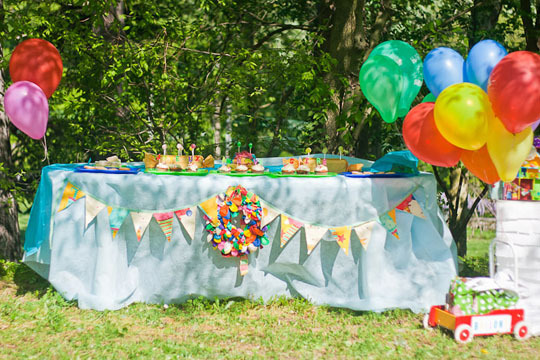 Francine shares: Kieran's second birthday party was inspired by the Pixar movie UP! We used balloons as the main decorating element, including using them on a cardboard replica of Carl and Ellie's house. The replica was made by my husband using three large furniture cardboard boxes turned inside out. On the gifts table they made a smaller replica using a wooden shadow box house and also created Paradise Falls using crepe paper. The food was all homemade by us: cookies, cupcakes, sandwiches, sausage rolls, fruit salad, and the birthday cake. There was vanilla ice-cream too! She made fabric tote bags to use for goodie bags and they contained a car caddie, an Adventure Book, an activity book, a crayon, and a foam paintbrush and mini canvas for the art activity: hand print canvases. The three little guests were also given home made playdough to take home. The bags were housed in Kieran's little walking wagon which was made into a balloon cart. Party hats were made from 12x12 scrapbook paper. Check out Francine's blog Callaloo Soup where she shares more of the party here and here.